This luxury bar in Knightsbridge promises the ultimate in sophistication and glamour. As the name suggests the interior is high glamour, designed in seductive shades of cream, gold and black with many bespoke touches. 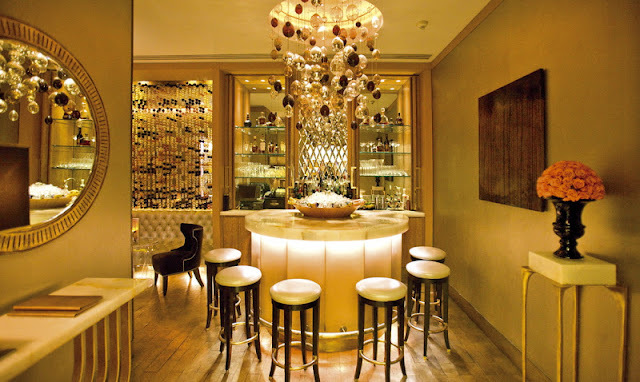 The compact list of ten Champagnes includes Louis Roederer Cristal and there is also a Bellini collection and cocktail list featuring monthly specials. GILT has turned Chocolate Week into Chocolate Month with a fabulous Chocolate Martini. Available throughout October, it's the perfect drink for a late night chocoholic! Made from milk chocolate and hazelnut, garnished with a chocolate macaroon - our mouths are watering just thinking about it!